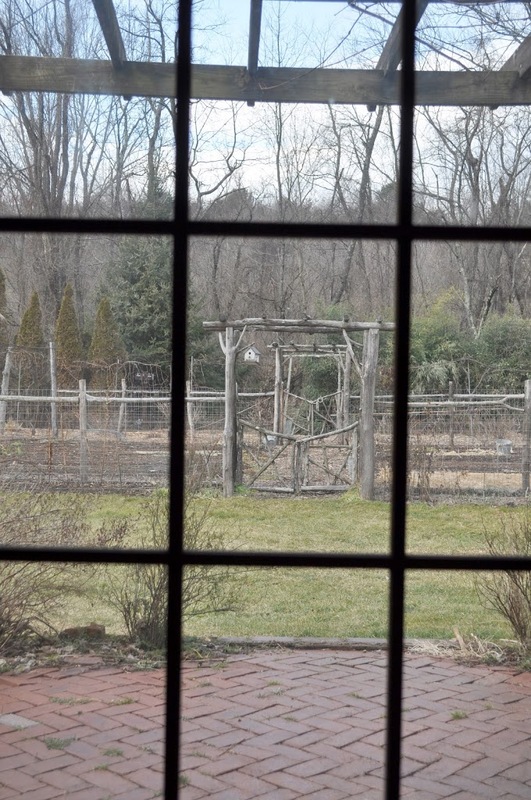 A vegetable garden needn’t be an eyesore, even in winter when nothing is growing in it. Consider the fence, which endures year ‘round. How about white pickets, rustic cedar or locust, or fanciful arches of rebar filled in with mesh? And no need to segregate plants, banning ornamentals from the vegetable garden. How about dwarf boxwood as accent or edging within the garden and shrubs outside the fence to soften its transition to lawn? How about some cover crops in the vegetable beds for a verdant cover, turned tawny this time of year, which also improves the soil? How about an arching arbor as an invitation to enter the garden, the arbor perhaps dressed up with clematis, whose fuzzy seedheads persist long after the flowers fade. Once a vegetable garden becomes inviting, there’s no longer the need to relegate it to that distant corner of the yard. Move it closer to the house or, even better, the back door or, better still, right against the house, linked to it with eyes and feet. (Brick house, brick paths; white clapboard house, white picket fencing; etc.) Now you have a garden that not only looks prettier, but one that also will get more care and use because of its proximity and visual draw, ad looks good even in winter. Although I am loathe to move the vegetable garden, with its 30 years of compost-enriched soil, closer to the house physically, I have attempted to do so visually with a series of gateways and arches. Standing in my kitchen and looking out a glass, sliding door towards the garden carries your eyes under the grape arbor over the terrace attached to the house, across a small patch of lawn, and thence through a rustic, locust arbor into the garden. The path through the garden carries you further, across the garden and then out through another arbor, the path extending into a berry patch. Further along, that path ends in yet another, arbor, this one simpler, and finally outside the planted areas to a short path that meanders mysteriously out of sight into a patch of bamboo. Still, my landscape seems too disjunct. The gardens aren’t sufficiently tied to each other or to the surrounding landscape and house. The vegetable garden also is now too gray and brown. The evergreen white cedars, boxwoods, and Meserve hollies around and near the gardens cheer and warm up the landscape, but more is needed. The traditionally coldest part of winter is past and it hasn’t been very cold, so I may risk expanding the outdoor evergreen palette, which is somewhat limited this far north. Temperatures did drop to about 5°F a few weeks ago, but nighttime lows at the end of January were only in the 20s, nothing like the lows of minus 25° experienced many years ago. The USDA, recognizing the shift to warmer winter temperatures, recently updated their cold hardiness zone map, available at http://planthardiness.ars.usda.gov/PHZMWeb/. Wavy lines overrunning this map bracket each zone, from 1 through 11, delineating the average annual minimum temperature within each zone. (My garden, over the years, has been re-classified from 4b to 5b.) 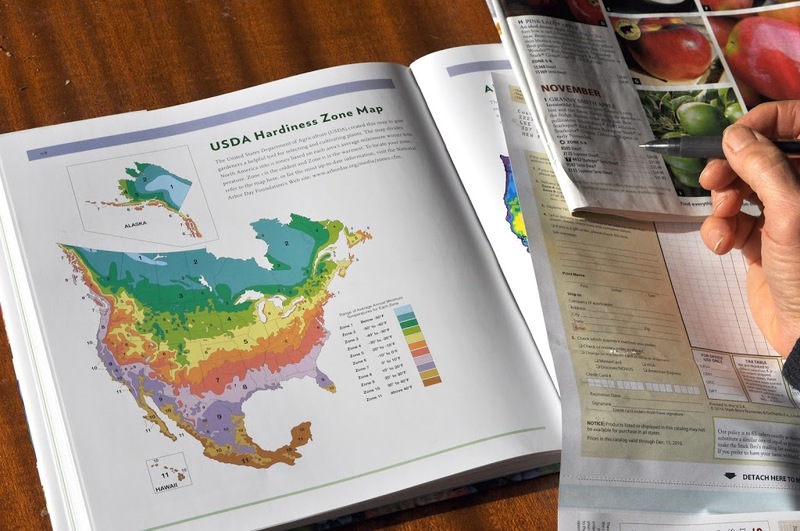 Nursery catalogs and tags on plants in local nurseries spell out, among other bits of information, the hardiness zone limits for specific plants and varieties. Helping me out on my search for new evergreens will be Michael Dirr’s new book, Encyclopedia of Trees & Shrubs, a weighty and informative tome in all respects. In a few years, with continued warming, I may try planting two southern evergreens that I long for here in the north: southern magnolia and camellia. « NEW FRUIT BOOK HOT OFF THE PRESS! Thanks for the new book – I’m hoping to get it for Fathers’ Day. I value the information you share in your books and blog – but crave more. Isn’t it time for you to write about nut trees? I’ve been going . . . whoops, growing . . . and studying nuts for years. Perhaps you’re right about a nut book. I think nuts are attractive trees and shrubs and a great, but overlooked, food. I have read your posts all night and want to get some of your books on cyber Monday. I am concerned that your information may not be as useful to me. I live in deep south coastal Georgia on one of the barrier islands. I have just acquired 4 acres and desire to have a garden and fruits. Is there an author you recommend that is like YOU but located on the coast? Most of what I write is not site specific, except as relates to planting dates and cold hardiness. Making compost, training tomatoes, organic soil management, etc. don’t vary from location to location.